Published: July 20, 2017 at 02:10 p.m. Updated: July 20, 2017 at 07:19 p.m.
Last week, I assembled an all-star team of the players who have played for Bill Belichick. This week, I thought I'd do the same for another longtime head coach: Pete Carroll. I've gone over Carroll's head-coaching tenures with the Seattle Seahawks (2010-present), USC Trojans (2001-09), New England Patriots (1997-99) and New York Jets (1994) and compiled an offense, defense and special teams using the players Carroll has led. Note: As with the Belichick team, the player's team and tenure under Carroll is listed next to each player's name. Also, I weighed players -- including those he coached at USC -- according to the entirety of their NFL careers. Pete's been lucky in the quarterback department, having coached Drew Bledsoe in New England, Carson Palmer at USC and Boomer Esiason with the Jets. But for the purposes of this exercise, Wilson ranks above all of them. 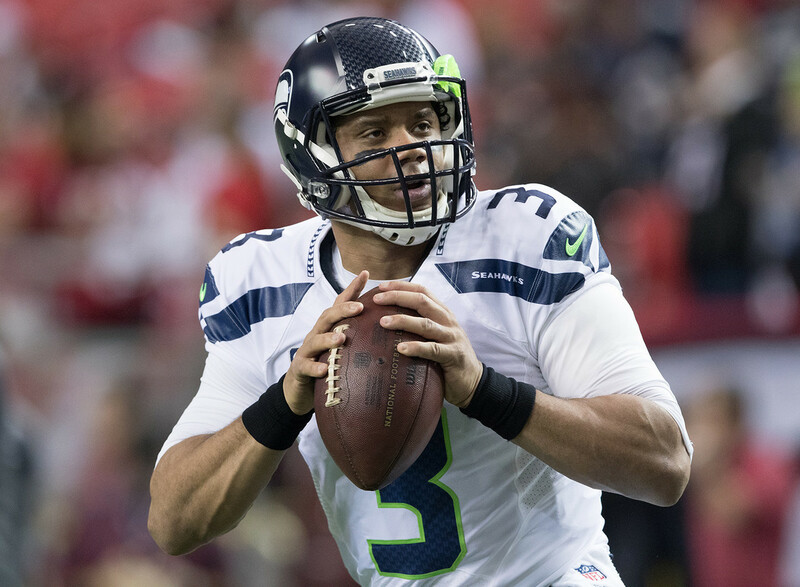 His credentials don't need listing, but here goes: In five seasons, Wilson has 56 quarterback wins (tied with Matt Ryan for the most in a player's first five seasons), a 127:45 TD-to-INT ratio, a 99.6 passer rating, and, of course, a 1-1 record in the Super Bowl. The three-time Pro Bowler has certainly provided quite the return on the third-round pick Seattle used to acquire him in 2012. Lynch will always be remembered for the "Beast Quake" run that helped push the 7-9 Seahawks to a wild-card upset of the defending-champion Saints in the 2010 playoffs. The quintessential power back started 14-plus games in Seattle from 2011 to '14, and in that span, he scored 48 rushing touchdowns, 14 more than any other NFL player. Martin spent just one year with Carroll, but the Hall of Famer was, to put it mildly, a great football player over the course of his 11-year career. Martin ran for 1,000-plus yards in 10 seasons, tied for second-most all-time behind Emmitt Smith (11). He also racked up 3,518 career attempts (third-most all-time), 14,101 rushing yards (fourth), 90 rushing touchdowns (13th), and 17,430 yards from scrimmage (eighth). Martin could run, he could catch -- and he's a quality person. Note: To make room for Martin and Lynch -- and because of the lack of talent at receiver -- I've gone with two backs and two receivers for this team. Baldwin, who has led the Seahawks in catches in each of the past three seasons, gets better every year. In 2011, he became the first undrafted rookie since 1960 to lead his team in receptions and receiving yards, and last season, he earned his first career Pro Bowl nod. He's always had talent, but he didn't always stand out for his ability to get open. Now, though, he's hard to cover -- and the chip on his shoulder just keeps getting bigger. When the Patriots drafted Glenn in 1996, owner Robert Kraft wanted him and then-coach Bill Parcells didn't. Glenn made Kraft look good, collecting 90 catches for 1,132 yards as a rookie. Glenn's high-water mark under Carroll came in 1999, when he made the Pro Bowl on the strength of a 69-catch, 1,147-yard campaign. Coates made the Pro Bowl five times and was a two-time first-team All-Pro, recording 499 career catches and 50 touchdowns. When he first came into the league as a fifth-round pick by the Pats in 1991, Coates presented a real mismatch problem for opposing defenses as a 6-foot-5, 245-pound tight end who could run fast. In the mold of Rob Gronkowski, Coates was very difficult to cover. Current Seahawks tight end Jimmy Graham is good, but I'd slot him in after Coates. Unless you saw Coates play, it's hard to appreciate just how great he was. Armstrong spent 14 seasons with the Patriots after being picked 23rd overall in the 1987 NFL Draft, earning the sixth and final Pro Bowl selection of his career in his first season with Carroll (1997). Only Tom Brady (235) has started more games for the Patriots than Armstrong (212). The ninth overall pick in the 2011 NFL Draft has become one of the best young offensive linemen in the NFL. And I think the competitive, long-armed and athletic Smith will continue to get better. He began his career as a right tackle but has since solidified himself on the left side as a four-time Pro Bowler and two-time first-team All-Pro. The seventh-round draft pick in 2012 turned himself into a three-year starter at guard, collecting 49 starts at Seattle. Back surgery kept him off the field in 2016, his first season with the Buccaneers. A second-round pick in 1993, Rucci spent seven years in New England, starting for the team in Super Bowl XXXI against the Packers. He was very strong and a good pass-blocker. It's a coin flip between Unger and Ryan Kalil, who played for Carroll at USC. I think Unger is a little bit more effective as a blocker. He can play guard or center -- and he also helped net the Seahawks Jimmy Graham in a 2015 trade with the Saints. McGinest led the Patriots in sacks with nine in 1999, Carroll's last season with the organization. That New England defense played pretty well, allowing just 284 points, and McGinest was one of the team's best defensive players. Bennett is an outstanding pass rusher who's racked up 30.5 sacks in the four seasons since he signed with Seattle, the second-most sacks on the team in that span (behind Cliff Avril's 33.5). He began his career with the Seahawks as an undrafted free agent in 2009 but was waived and claimed by the Bucs, with whom he spent four seasons before returning to the 'Hawks. A third-round pick in 2007, Mebane started 125 games for the Seahawks in his nine-year tenure with the team. He has outstanding quickness for the position and is very good against the run. Sometimes it seems like Pete had more good players at USC than he's coached at the NFL level. Casey is a terrific pass rusher for a defensive tackle, registering a career-best 10.5 sacks in 2013. He's also very good against the run. Casey made the Pro Bowl in each of the last two seasons. Wagner is a three-time Pro Bowler and two-time first-team All-Pro -- and he's been in the league just five seasons. He's a powerful tackler (645 career tackles and counting) and an excellent player, with the instincts to play in space (six career picks). The 2011 fourth-round pick made the Pro Bowl for the first time last season. He's started 88 games over six seasons and has recorded 100-plus tackles in each of the past three campaigns. Wright, who was a very good high school basketball player in Memphis, is an outstanding athlete. Here's a story that illustrates how smart Slade was as a player: One Sunday, I received a call from Slade, who said, "Gil, today, I'm going to make an interception." Apparently, he'd deciphered the hand signals Dolphins quarterback Dan Marino had been using for umpteen years. Lo and behold, Slade followed through, picking off a Marino pass for just his fourth career interception (including playoffs). The 2011 fifth-round pick switched to defensive back from receiver late in his Stanford career, but the position clearly suits him well, as he's picked off 30 passes in six seasons, more than anyone in the NFL in that span. The tall, athletic Sherman has been a centerpiece of the Seahawks' success under Carroll. Law was one of three players -- including Willie McGinest and Adam Vinatieri -- to make both this team and the All-Time Bill Belichick Team I put together last week. The last season Law played for Carroll, in 1998, was probably his best, as he recorded a league-high nine picks and made the Pro Bowl and was named a first-team All-Pro. Thomas has picked off 23 passes and forced nine fumbles in his first seven seasons. The 2010 first-round pick has great ball skills and coverage ability. A broken tibia interrupted his 2016 season, but presuming he recovers fully, the five-time Pro Bowler and two-time first-team All-Pro will continue to help anchor the "Legion of Boom." Polamalu -- an eight-time Pro Bowler and four-time first-team All-Pro who had 32 career picks and 755 career tackles in 12 years with the Steelers -- had an amazing ability to diagnose plays. There were so many times when you thought Polamalu was out of position, and then he'd come in and make the play. Polamalu looks like a lock to be the first Pro Football Hall of Famer who wore the No. 43. Ronnie Lott and Lawyer Milloy also received consideration for this spot. In the time he was with Pete in New England, Vinatieri made four field goals of 50-plus yards. He also scored 100-plus points in all three years. Ryan started his career in Canada and spent two seasons with the Packers before landing in Seattle. He holds the single-season franchise records for both gross (46.6) and net (40.8) average punting yards. A top sprinter for the track team at Fort Valley State, Lockette dazzled with his speed at the NFL Scouting Combine, even if he was a thin guy. He used that world-class speed to cover kicks and cover them well. He was a rare athlete who had a productive but short career before a neck injury forced him to retire early. The third-round pick in 2015 was selected to the Pro Bowl as a rookie kick returner. Lockett scored on both punt and kickoff returns in his first NFL season. He holds the franchise record for most punt-return yards in one game (139). He's also a very good receiver.